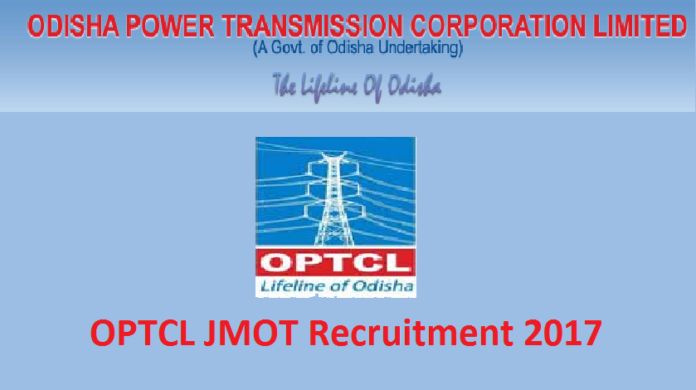 The Odisha Power Transmission Corporation Limited has released OPTCL JMOT Recruitment 2017. Candidates in search of Government Jobs can get ready to use this excellent opportunity. Authorities invite online applications to fill 150 Junior Maintenance & Operator Trainee Posts. As of now, it is a great opportunity for aspirants seeking Odisha Govt Jobs. Check the eligibility criteria details and then start enrolling for OPTCL Jr Maintenance Operator Vacancies through online mode at optcl.co.in. Odisha Power Transmission Corporation Limited (OPTCL) is the largest Transmission utility in the country and was incorporated in March 2004 under the Companies Act, 1956. It is wholly owned by the Government of Odisha to undertake the business of transmission and wheeling of electricity in the State. According to this information, now they have released OPTCL JMOT Recruitment 2017 for 150 posts. Aspirants those who are willing to apply for Jr Maintenance & Operator Trainee must follow the instructions carefully. Submit the application forms on or before April 24, 2017. Now it is the time to know education qualification & age limit details. Candidates should have completed HSC or equivalent, and National Trade Certificate in Electrician Trade from Institution recognised by SCTE&VT/NCVT with minimum 60% marks for General & SEBC candidates and 50% for SC/ST Category. Soon after checking these details if candidates satisfied then apply for OPTCL JMOT Recruitment 2017. Well moving to the age limit, applicants must not be under 20 years of the age and must not be above 32 years as on 1st Jan 2017. The selection criteria is CBT (Computer Based Test), Skill Test and Career Making. Applicants if you have any doubt, please do refer the OPTCL Junior Maintenance Operator Trainee Notification 2017 clearly. While registration pay the application fee Rs.500 by unreserved/SEBC Category and SC/ST/PWD category Rs.250 through Debit/Credit/Net Banking. Shortlisted candidate’s pay scale will be Rs.5200 to Rs.20200 with Grade Pay Rs.2130.Therefore, complete the process of Odisha OPTCL JMOT Apply Online 2017 through accessing optcl.co.in before April 24.